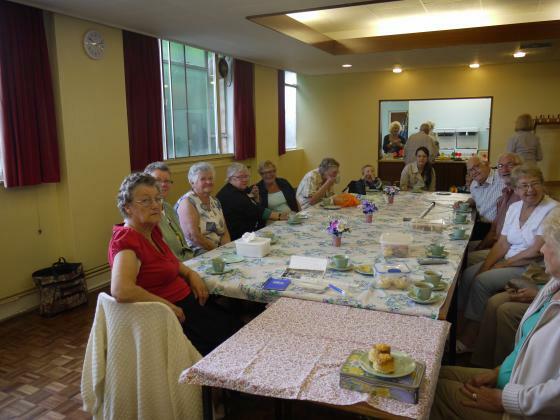 The Coffee Pot Bar was held monthly at the Rothley Centre from 9.30-11.00 and was a rich source of old photographs and memories. Sadly, it ended in July 2012, following the loss of accumulated funds from the Rothley Centre Office by an intruder. Rose felt that she could not carry on after such a blow. We will miss your mornings, Rose, and on behalf of everyone who enjoyed them I would say a very big thank you for what you have done for the village over so many years. We have appreciated it all. 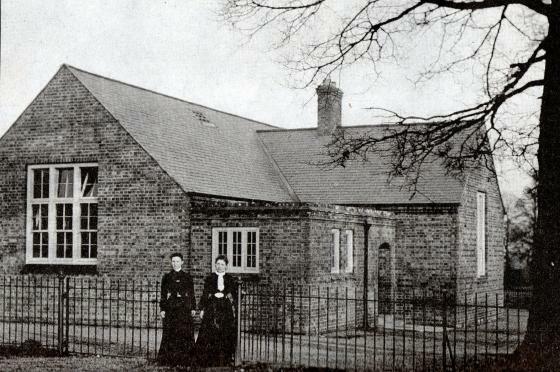 The Limes", Mountsorrel Lane, Rothley. The surgery of Dr. McQueen. Then it became a hotel followed by conversion into flats and bungalows. It was a surgery in 1962. 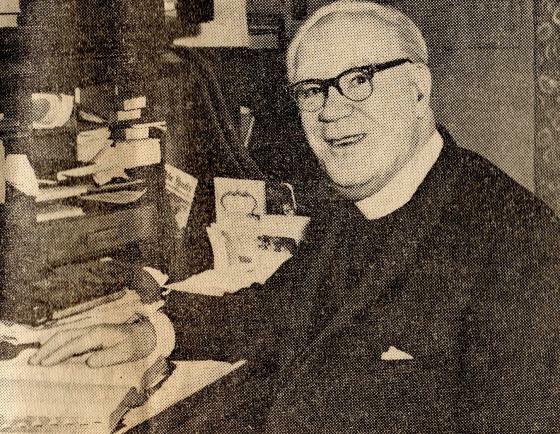 Vic Toon in 1965, Chairman of Rothley Parish Council for 20 years. His wife kept a Grocery Shop in Town Green Street which had been in the family for 55 years. Miss Boyer. Unknown child. Miss Porter rigtht? Mr Vann and his wife Linda of 103 Mountsorrel Lane, Rothley celebrated 50 years of happy married life. 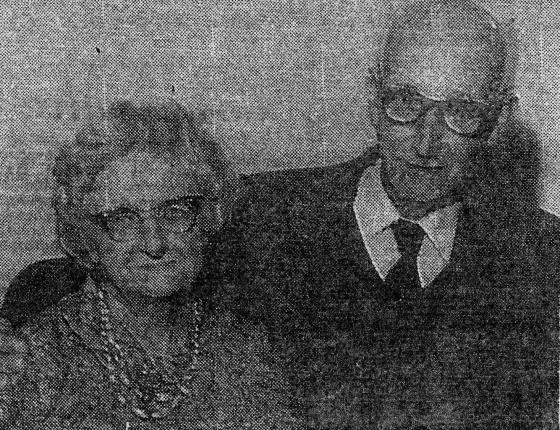 They were married on the 16th October 1924 at Rothley Baptist Church where they are still regular attenders and where Mr Vann is still a deacon. 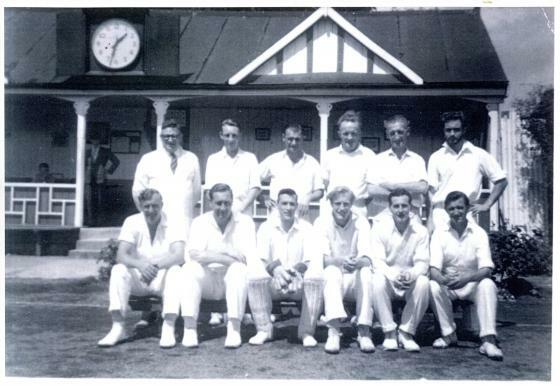 He began with the cricket club as a playing member and was then chairman for 25 years. He is now scorer. 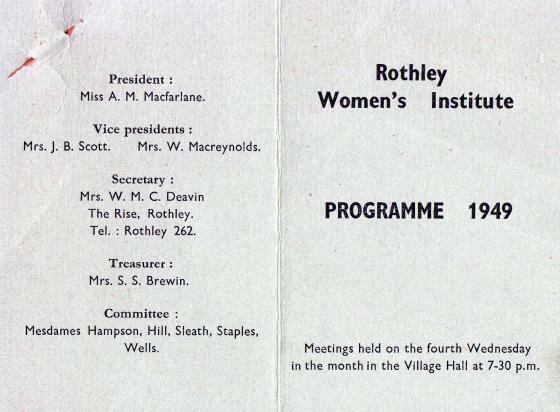 Other interests include Rothley Darby and Joan Club and gardening. Mrs Vann, who celebrated her 77th Birthday the day after their Golden Wedding Anniversary, is a member of the Rothley Women's Institute and the Women's Meeting at the Baptist Church. The couple, who have one son and two daughters, will be holding a family party tomorrow (Saturday) at the Tudor Restaurant, Woodhouse Eaves, to mark their Golden Wedding. Mr Cecil Brunt, captain of Rothley Park Cricket Club First Eleven, said on Friday that "whatever other achievements may have been attained by the club he would always regard the 1960 season as David Lole's". Mr Brunt was replying to the toast to the club at the annual dinner at the Bull's Head Hotel, Quorn, and said 16 year old David, brilliant all-rounder, had received trophies for topping both the batting and bowling for the First Eleven. "His bowling performances also made him top of the North Leicestershire League-an achievement probably unrivalled in league history", he said. Skipper Brunt went on to say that the past season had been a difficult one through the loss of fast bowler Steve Ball and the in and out form of recognised batsmen. Although he congratulated his brother, Eric Brunt, on a return to his best form. 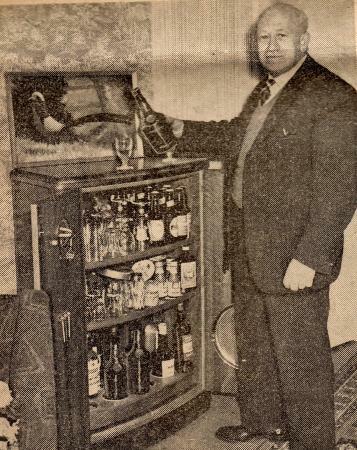 Mr. H. Lovett, replying to a toast to the visitors, given by Mr. Reg Simmons, congratulated the club on the position attained in the league last season, third, and in their enterprise in erecting a fine pavilion which should prove an asset to both the club and visitors. He considered the park one of the most improved sides in the league. 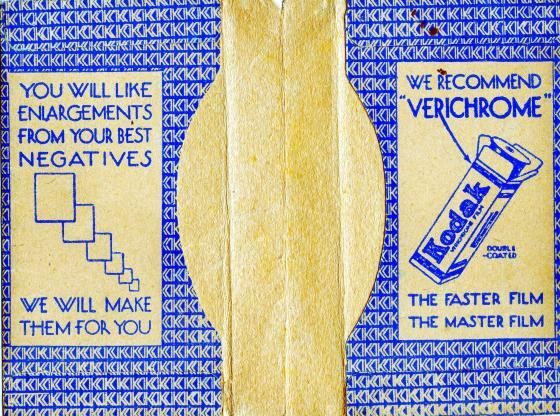 They had the yardstick to measure the strength of any team, youth and experience. Other players to receive trophies were: Batting, Second Eleven, Ron Stokes; bowling, Second Eleven, Jim Hyman; catching prize, Peter Chester. A book was presented to club chairman, Mr H. Vann in appreciation of his services as scorer for many seasons. Chairman was Mr. P. Wykes, supported by Mr. H. Vann (club chairman), Miss D. Wykes, and Messrs. H. E. Winks, G. E. V. Dunn, R. Simmons and G.A. Hutchins (vice-presidents). Toast to the club was given by Mrs. H.E. Winks, M.C. was Mr. John Copson. 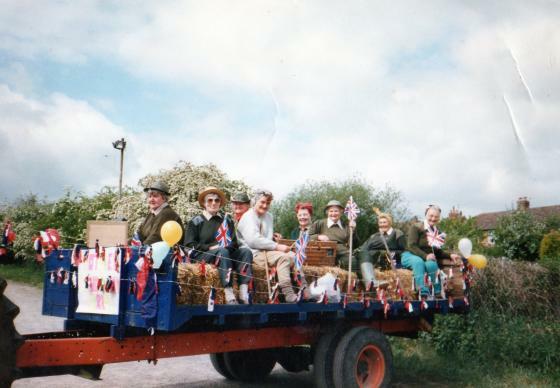 ON THE FLOAT DRESSED AS LAND GIRLS 1995 WAITING FOR THE OFF IN THE ROTHLEY CENTRE CAR PARK. 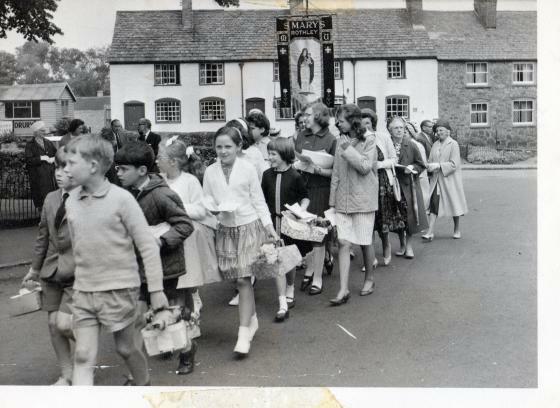 The Rothley Church Sunday School Anniversary Parade in June 1965 walking by Cross Green in Rothley. At the far back behind the lady with the umbrella could be Thora Westbury and Miss Boyer. 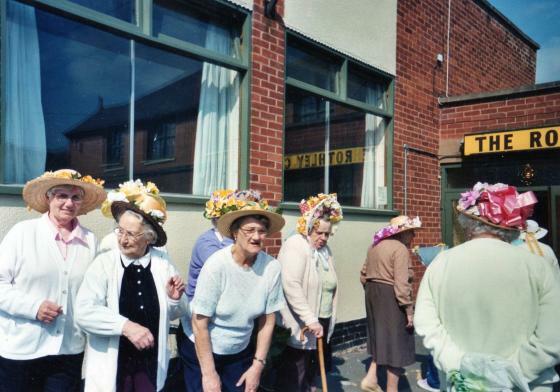 At the back, far left of the photo in the white hat is Mrs Kerry. 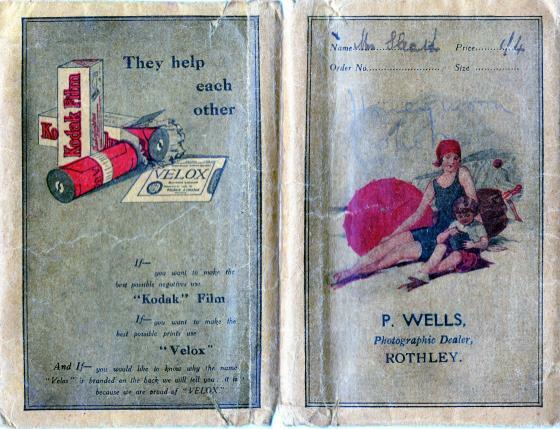 With thanks to Kathleen Raynor for donating the photograph. 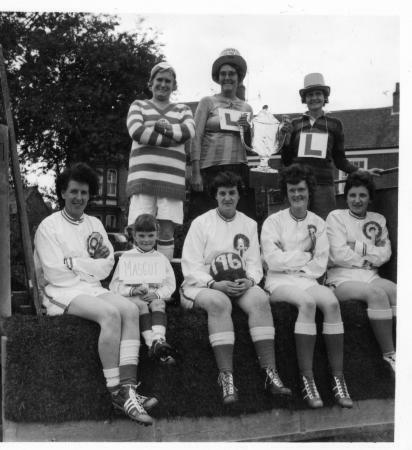 One of the Carnival Floats in 1964 to celebrate Leicester City winning the Football League Cup Final. The ladies shown are from the Women's Section of the British Legion. The above event was a British Legion childrens party held in Rothley Village Hall. 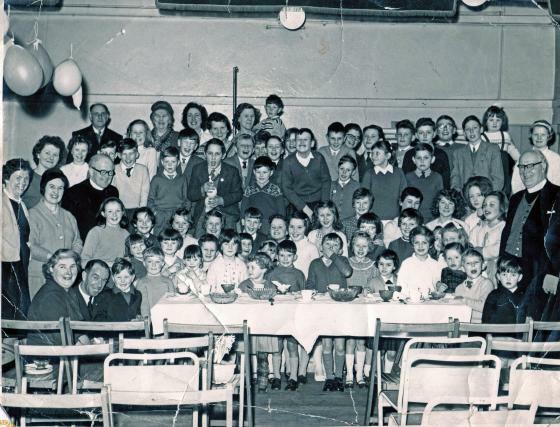 Linda Poole (nee Holt) is at the back of the table but others await identification. 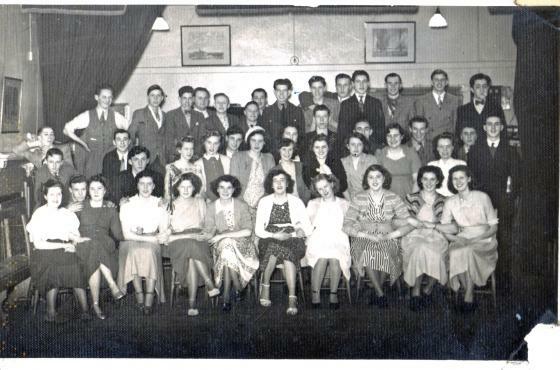 Rothley Youth Club Party 1948 or 1949. Names to be indentified. Mary Chester and Margaret Seal. 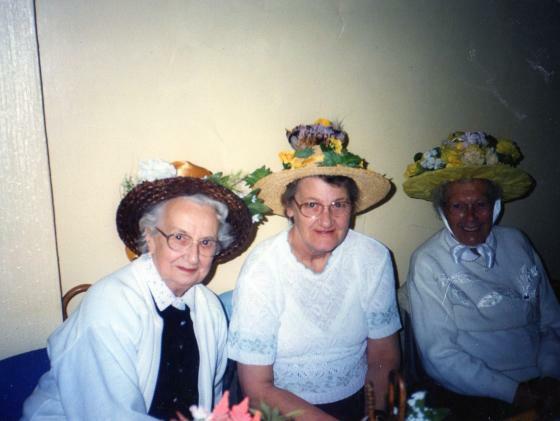 Bernice Wilkinson, Joan Baker, Thelma Waterfield and Margaret Hartshorne. Gillian Kinch and Gilbert Kinch as the young attendants. 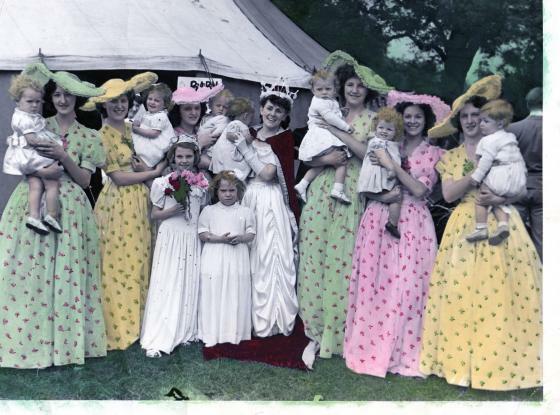 They are aged 5 years and are dressed in the Bridesmaid and Page Boy outfits worn at the wedding of Roy and Florrie Stokes of Rothley. 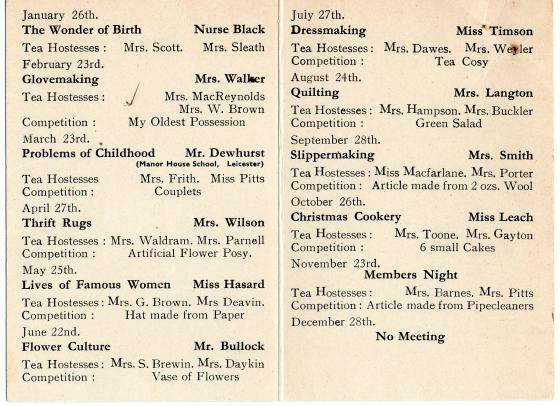 This event in 1948 took place on the Town Green Street Playing Field. 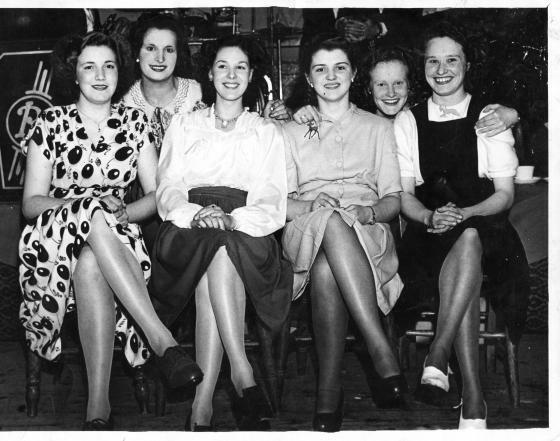 Bernice Wilkinson, Margaret Seal, Joan Baker, Carnival Queen Maureen McCrum, Margaret Hartshorne, Thelma Waterfield and Mary Chester. 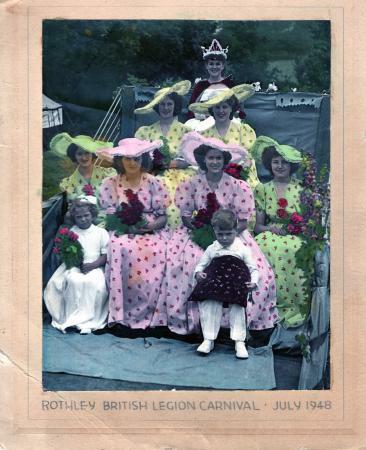 With thanks to Margaret Seal (Fowkes) for indentifying the Carnival Queen. VE PARTY 1946 OUTSIDE THE LIBERAL CLUB, MOUNTSORREL LANE, NOW THE ROTHLEY CENTRE. 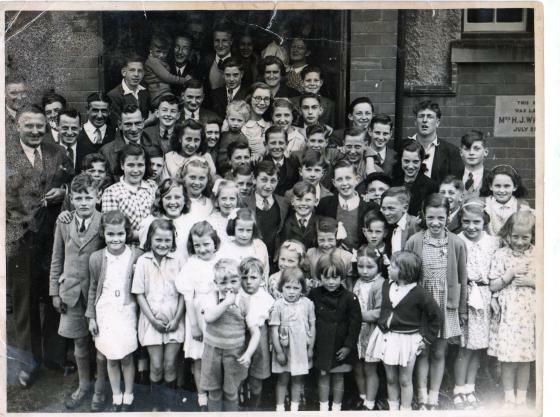 The above photograph shows the residents of Woodfield Road and Mountsorrel Lane at their party for the children to celebrate VE day 1945. Maurice Nixon, Phil Black, Derek Warrington, Thelma Waterfield, Mr. Allen, Mr. Blythe, Herbert Leake, Harry Nurse, Claude Baker, Charlie Kitchen, ? Higgins, Denise Warrington, Ron Stokes, Mrs. Willars, ? Waterfield, Sheila Black, May Worden, Margaret Hartshorne, Rose Squires, Phil Pentelow, Derek Palmer, ? Waterfield, ? Waterfield, Brenda Hartshorne, Margery Hancock, Geof Boultby, ? Waterfield, Mick Bradshaw, Joe Reed, David and Peter Sibson, ? 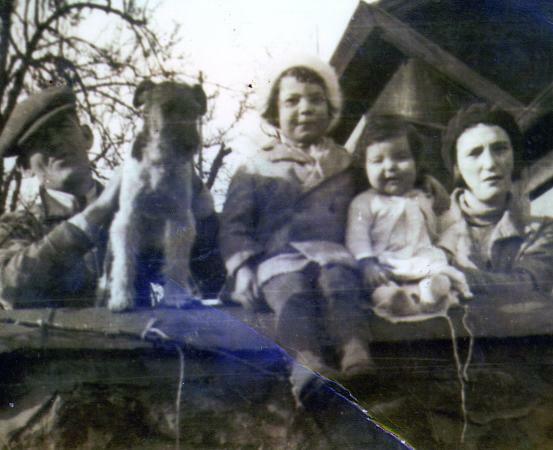 Allen, Joyce Leake, Greta Garner, ? Mitchelll, Pete Bradshaw, Josie Cook, ? 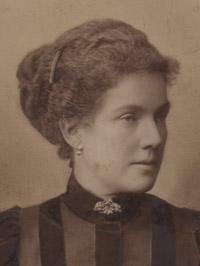 Hancock, Pearl Pentelow, Margery Warrington, ? Leake, Janice Willars, David Black, ? Higgins, Monica Cook, Pat Rodwell. The smaller children not yet identified. 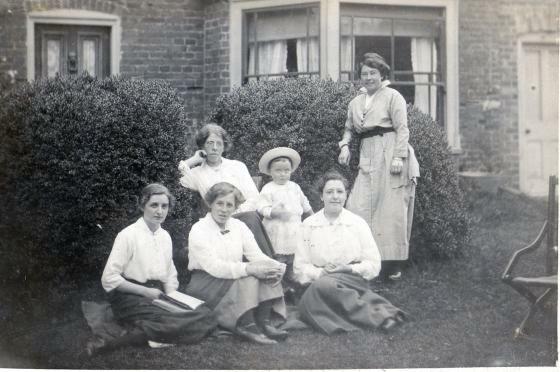 Sheila Fantam, Betty Smith, Margaret Hartshorne, Thelma Black, Joyce Godwin, Mary Chester. 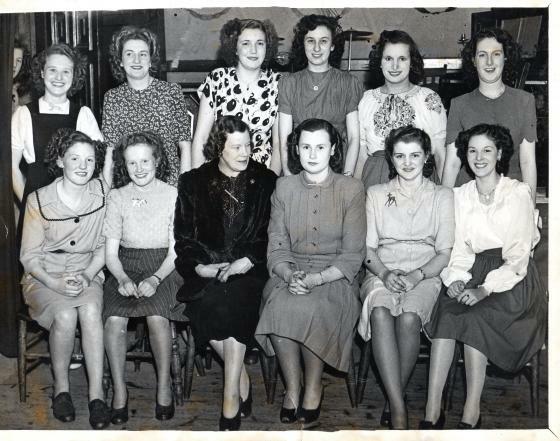 Joyce Elkerton, Margaret Fantam, Mrs Boddy, Isobel Barnett, Joan Baker, Thelma Waterfield. Margaret Hartshorne, Joyce Godwin, Thelma Waterfield, Joan Baker, Margaret Fantam, Sheila Fantam. Unsure of location. Possibly Thurcaston? 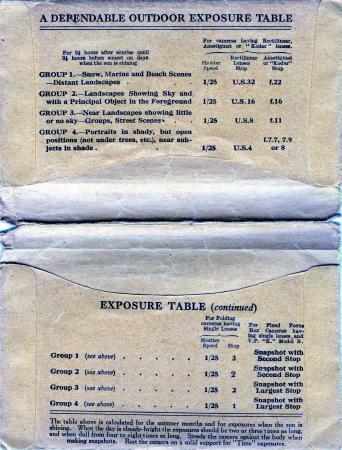 Original sepia photograph above. See below the same photograph in black and white for names. Geffrey Brewin, Horace Phillips, 3 Evacuees (one possibly called Keith Bourn), Phillip Pentelow, Shirley Toone, Geofrey Siddons. Evacuee (Audrey? ), Myra Bottrill, Ciciley Butler, Janet Siddons, Margaret Patrick, June Blyth, Sally Jarman, the White twins, Rose Squire, Sheila Black, Wendy (surname not known but lived on the A6), Lilly Sibson. 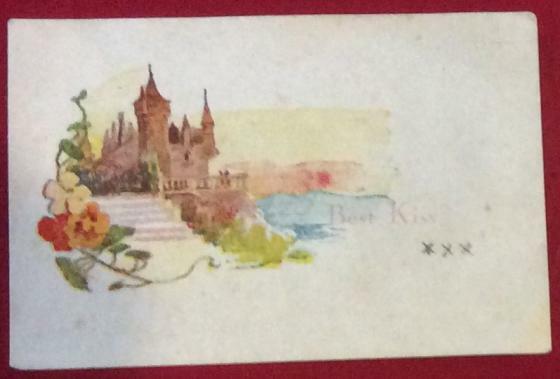 Ann Perkins, Evacuee not known, Dorothy Kinch, Thora Westbury, Rev. Beecher, Mrs. Beecher, Kathy Ross, Nora Ross, Bob Lovett, Wendy's sister. 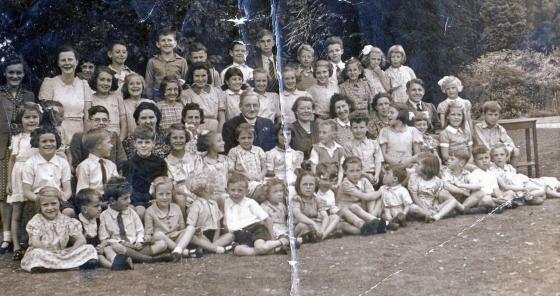 June Newby, Youmans boy, George Squire, Pamela Perkins, June Maiden, Jackie Baum, Yvonne Sibson, Norman Hardy, Michael Heady, Evacuee called Molly, Margaret Cooke, Jackie Crane, Peter Hollings. 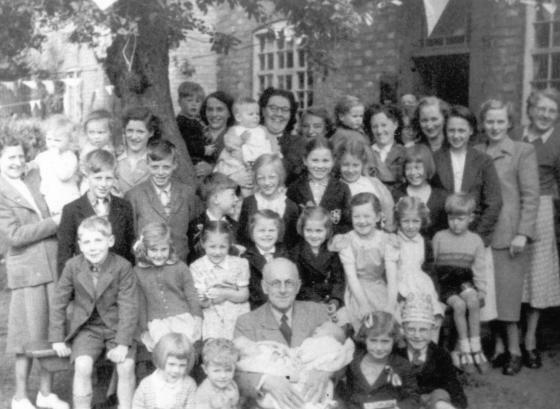 Kath Squire, Daniel Black, John Ross, unknown, Kenny Cooper, Mick Vestibular, Kath Newby, Joyce Newby, David Crane, Cranes' youngest girl, Graham Baum, Freda Pentelow, Roger Brewin, Perkins' boy, Maureen Baum, person lying down not known. With thanks to Rose Squire for the photograph and names. George Hartshorne on the left and his wife Daisy (nee Chapman) on the right with Betty Chapman next to the dog who was the daughter of Will Chapman the Greengrocer and the baby next to Daisy is Margaret Hartshorne. Betty Chapman died aged 5 years. They are pictured outside their home which was a wooden bungalow to the rear of the Post Office and the Chemist in Woodgate. The land it was on is now the sorting office for the Post Office (as this is written in 2011). With thanks to Margaret for donating the photograph. 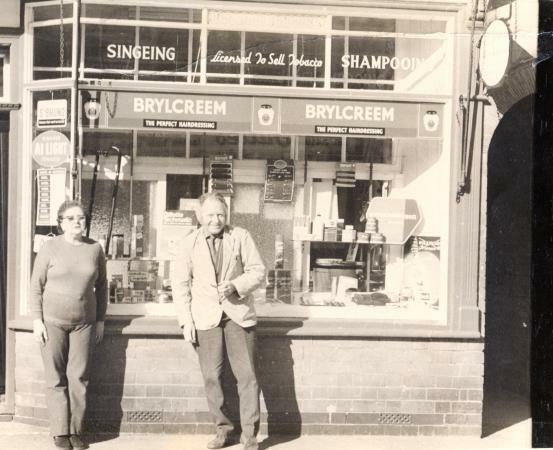 George Hunt, the barber, outside his shop in Woodgate, Rothley, with his wife Elsie. 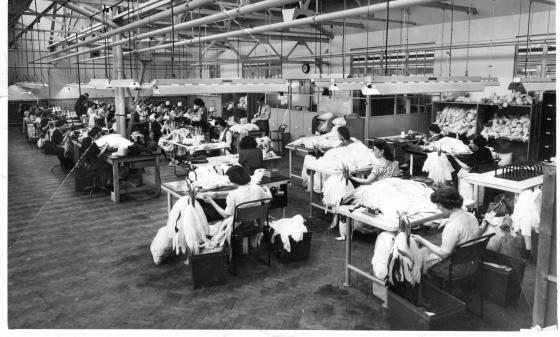 The above photograph of Bentley's Fully Fashioned Hosiery on Parker Drive, Leicester, has been included as Margaret Hartshorne is at the far end of the room. 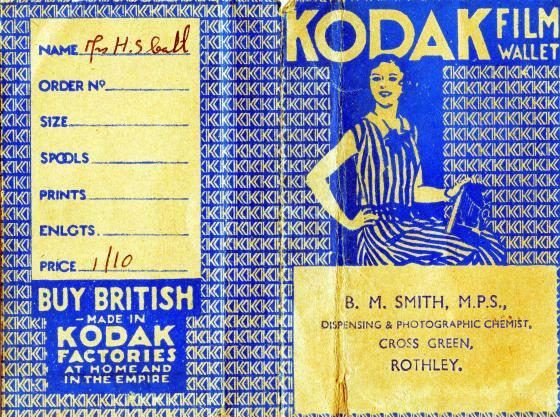 Margaret has a wealth of information about old Rothley and times past so this one has been included as one of her memories of her working life. Ted Dexter, Bob Perkins, Jim Esworthy, Steve Ball, Pete Chester, Ken Skinner. 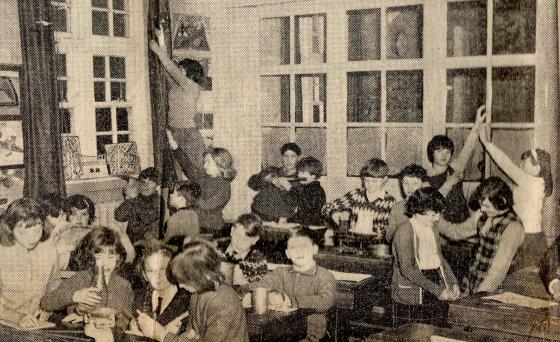 With thanks to Barbara Hutchins for the above photograph taken in the mid 1960's. Her Father ran this team and they played on Sundays and in the evening league. Most of the Sunday matches were friendlies and they played in Leicestershire, Nottinghamshire, Derbyshire and Lincolnshire. 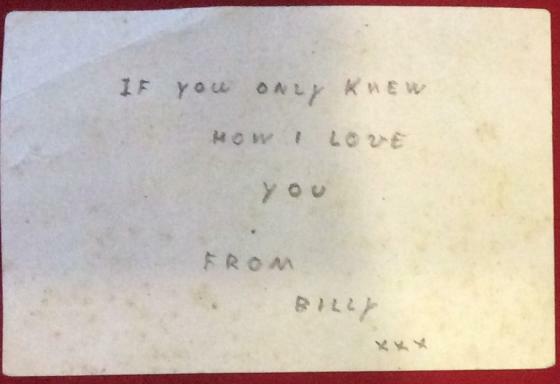 The above embroidered card was sent from the Front in 1915 from Billy (William) Holland to his wife May (Godwin). 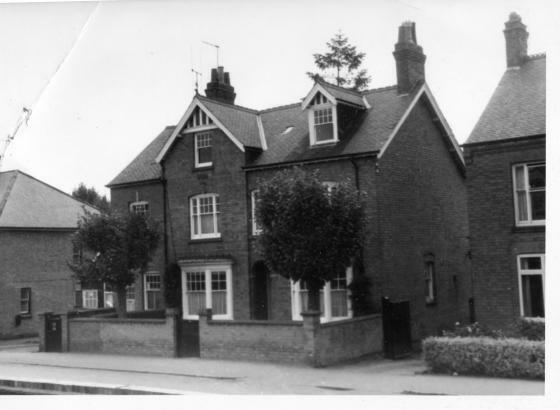 They lived in Walkers Yard, locally known as Teapot Lane. 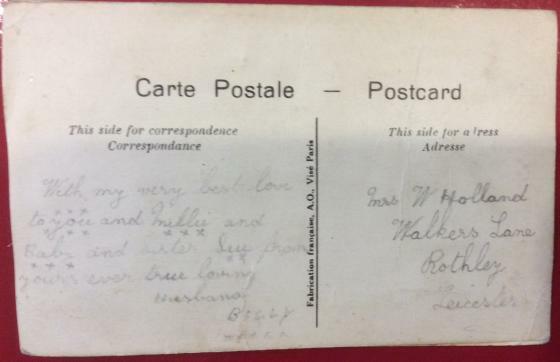 They had a daughter Millie and the postcard is kindly donated by her daughter Mary Geary (Soffe). 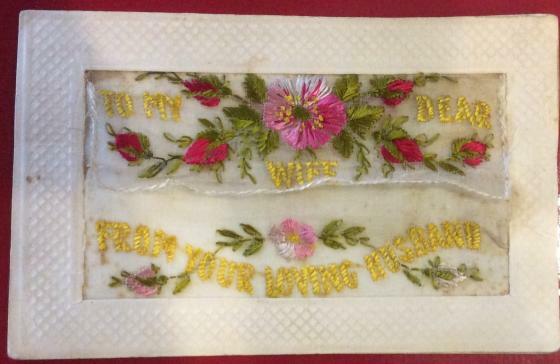 "TO MY DEAR WIFE FROM YOUR LOVING HUSBAND"